A really awesome teacher I have the privilege of working with and learning from shared this really nice opening conversation she had one day last week with her kindergarteners. Keri used a visual routine* called “look quick” to start off their math block. 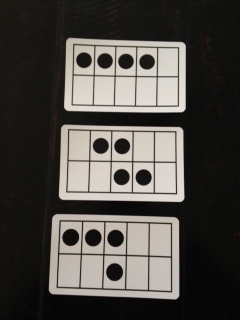 CARD #2: Then, Keri set out the second card she had selected for the day’s look quick sequence, and asked the students, “How many dots do you see and how do you see them?” They acknowledged that there were 4 dots, but their explanations were a bit different than I just know it. The students had different ideas as to how they found the 4 dots. Some kids started in the top left corner and counted by ones. Some saw three on the top and one more on the bottom and that made 4. Others started on the bottom and counted by ones. A few made two groups of 2. However, they all agreed that there were 4 dots. The students who used a strategy other than counting by ones are “conceptually subitizing; which means that they recognize small amounts and combine them to see them as a unit. Douglas Clements explains that ‘subtilizing is foundational to children’s number sense. He states that children use counting and patterning abilities to develop conceptual subitizing.’ This more advanced ability to group and quantify sets quickly in turn supports their development of number sense and arithmetic abilities.” (Shumway, page 34) Those students who saw two groups of two (2 + 2) and those who saw a group of 3 and a group of 1 combined the two groups to get one group of 4 are conceptually subitizing. This is all happening because the kids have had lots of opportunities every day, all year to think about numbers, explore numbers, and talk about what the see and what they know and what they think. Keri has made it an essential and integral part of the learning in her class. LAST QUESTION: Keri set out all three of ten-frame cards she used in the look quick portion of her warm-up and asked her students to talk about what they noticed. She used a slightly amended version of the I Notice, I Wonder™ strategy from The Math Forum at Drexel University found in the book Powerful Problem Solving by Max Rey. *FOOTNOTE: Jessica Shumway has a really nice piece about Visual Routines: Seeing and Conceptualizing Quantities in her book, Number Sense Routines. She talks about the use of routines in life and in math class, and how we can easily expand what we are already doing with math routines to include a number sense component. On page 22, Shumway talks about the different routines, what they each help with, how they work, and ways to use the routine and questioning strategies. Keri took the idea of using routines to build number sense that we had explored during some grade level work sessions, and adjusted it to fit her students and their needs, and has had great results. She has lots and lots of engaged confident math kids. It is awesome to see your hard work and passion show up in the classrooms of teachers you have supported, all to benefit students.